Credit: Chandra: NASA/CXC/Univ. of Utrecht/J.Vink et al. XMM-Newton: ESA/Univ. of Utrecht/J.Vink et al. 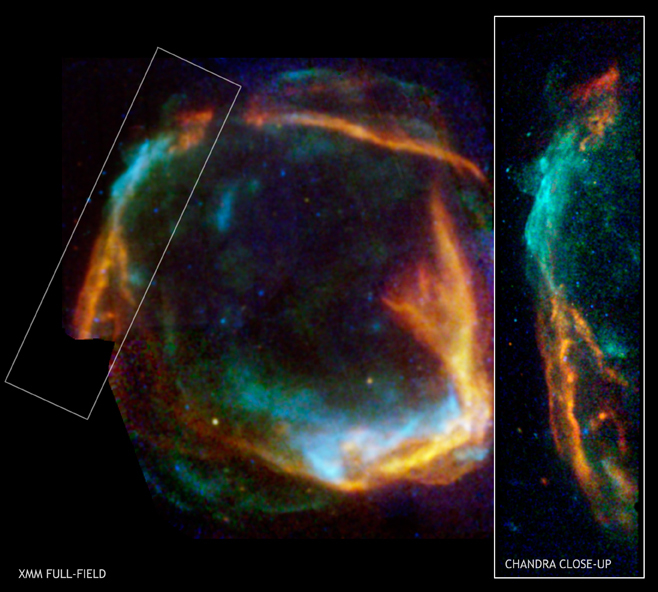 The combined image from the Chandra and XMM-Newton X-ray observatories of RCW 86 shows the expanding ring of debris that was created after a massive star in the Milky Way collapsed onto itself and exploded. Both the Chandra and XMM images show low energy X-rays in red, medium energies in green and high energies in blue. The Chandra observations focused on the northeast (left-hand) side of RCW 86, and show that X-ray radiation is produced both by high-energy electrons accelerated in a magnetic field (blue) as well as heat from the blast itself (red). Properties of the shell in the Chandra image, along with the remnant's size and a basic understanding of how supernovas expand, were used to help determine the age of RCW 86. The new data revealed that RCW 86 was created by a star that exploded about 2,000 years ago. This age matches observations of a new bright star by Chinese astronomers in 185 A.D. (and possibly Romans as well) and may be the oldest known recordings of a supernova. Supernova explosions in galaxies like ours are rare, and none have been recorded in hundreds of years. Credit Chandra: NASA/CXC/Univ. of Utrecht/J.Vink et al. XMM-Newton: ESA/Univ. of Utrecht/J.Vink et al. Coordinates (J2000) RA 14h 45m 02.30s | Dec -62º 20' 32.00"